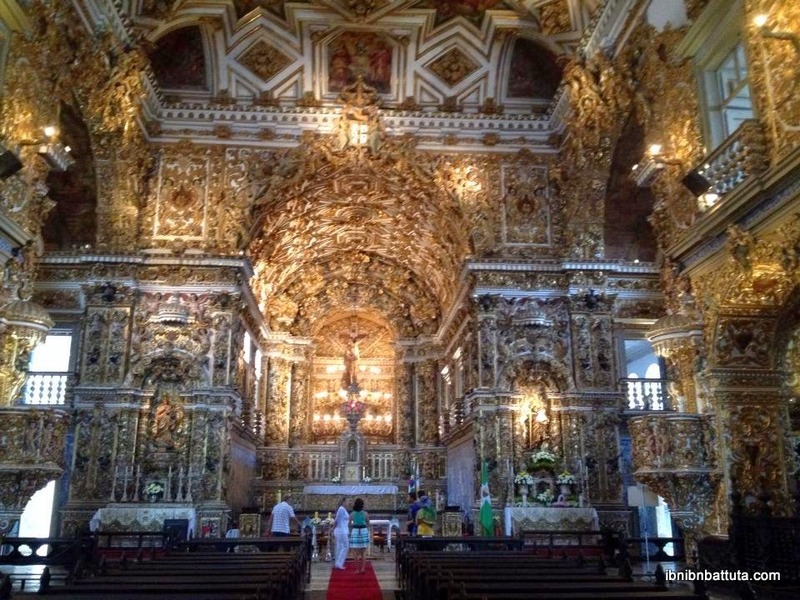 Salvador holds over 2,000 churches, but none more magnificent than the Church of São Francisco. Though we had planned to watch there in the square, in Salvador's historic Pelourinho district, soon it was too crammed with people and the mood shifted from festive to dicey. After witnessing a man get his chain stolen by kids, and police searching and questioning other locals, we escaped the square and found a restaurant with outdoor TVs nearby. A collective groan echoed across the city when Croatia, not Brazil, surprisingly scored first, via an own goal. However, the misery was short-lived, as the Brazilians struck back quickly; when star Neymar scored, a seismic eruption of noise reverberated through the streets. Brazil eventually managed a 3-1 victory, but not without some controversy over a dubious penalty call for Brazil and an equally bad decision to disallow a potential second Croatia goal. But with Brazil's win in the bag, the conversation quickly shifted to the next day's match in Salvador: Spain v. Netherlands. 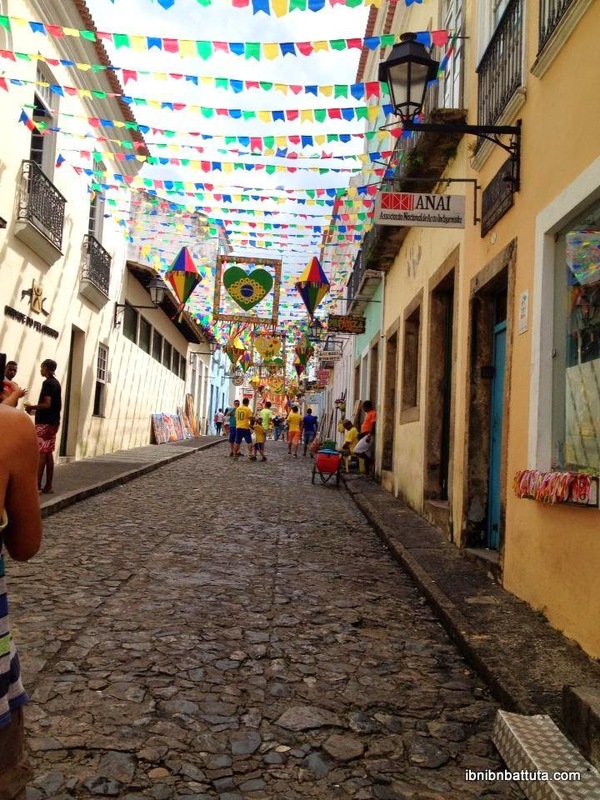 Salvador's Pelourinho district is home to richly colored buildings that reminded of the Rainbow Row in Charleston. In the hours before the match, what I saw outside the stadium blew my mind. A whole city square had become a sea of orange, filled with Dutch fans dancing in conga lines to Dutch music. Despite only having won a single major tournament (the 1988 European Championship), the Dutch have great fans and they travel well. A small Spanish contingent was also in the square, making themselves heard by singing "OOOOOO Campeones del Mundo" (to the theme of "Seven Nation Army"). Like Red Sox fans back home, after finally winning a major tournament after a long wait they liked to let everyone know how good they are. In the stadium, I found my seat behind one of the goals, in the midst of a large group of Spanish fans. 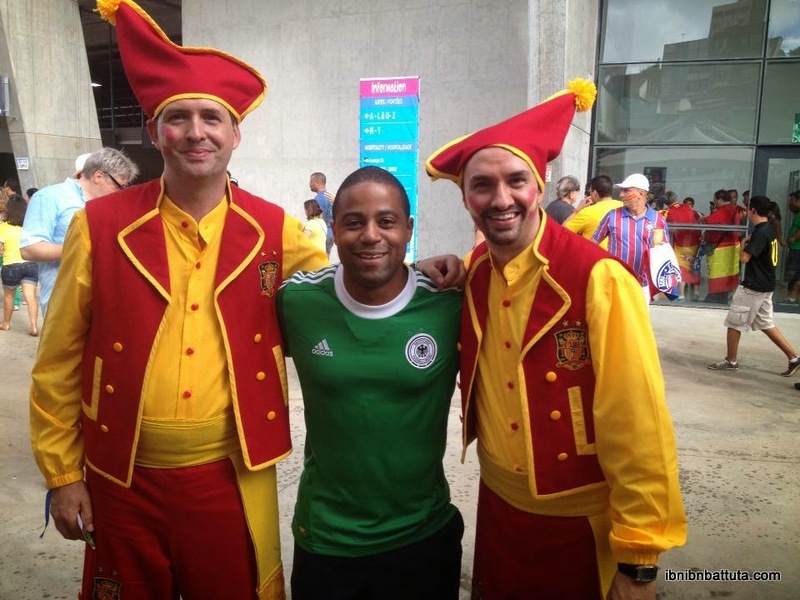 I started to chat with some of the Spanish supporters, who were immediately upset at the sight of my Germany jersey (a major rival). 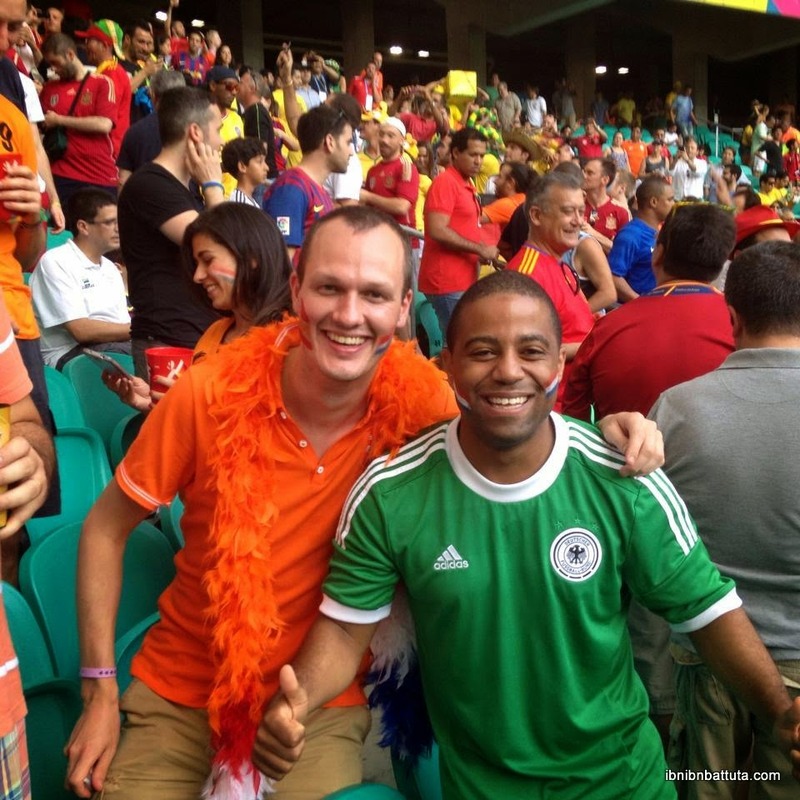 I migrated over to a small pocket of Dutch fans, who had soon painted a Dutch flag on my face. My earlier decision to remain neutral for this match now forgotten, I became a Holland supporter. 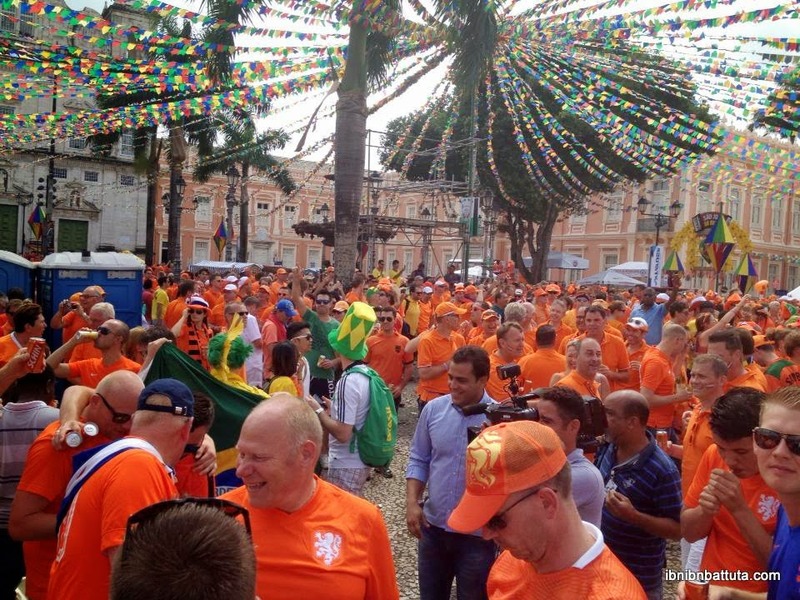 Before the fateful match, Dutch supporters filled a Salvador city square. As the match kicked off, the Spanish did their thing, passing the ball gracefully and maintaining possession. Their fans, meanwhile, were going nuts at each pass, as a nearby drummer pounded his drum to the chants of "ES-PAN-NA". The Brazilians in the audience, by contrast, spent their time heckling Spanish striker Diego Costa, a Brazilian-born star who had turned his back on the nation of his birth to play for Spain. Every time he touched the ball, he was greeted with boos and lewd chants. Costa and his side dominated the match until late in the first half, when Dutch striker Robin van Persie scored on an amazing diving header. Inspired, the Dutch came out on fire in the second half and took it to the Spaniards. Arjen Robben, who I have seen terrorize teams back in Germany's Bundesliga, controlled a long ball, cut inside on his left foot, shook two defenders, and chipped the ball over the onrushing Spanish goalkeeper. The stadium erupted. Not bad seats to see a historic game! I was cheering for the Dutch, but was very curious to see how Spain would respond to this unusual punch in the mouth. The answer: they rolled over. More Dutch goals poured in: a Stephan de Wrij header; a mistake from keeper Iker Casillas that gave van Persie his second; and finally my favorite goal, when Arjen Robben outran the Spanish defense on a breakaway, spun away from a diving Casillas, and rifled the ball home. 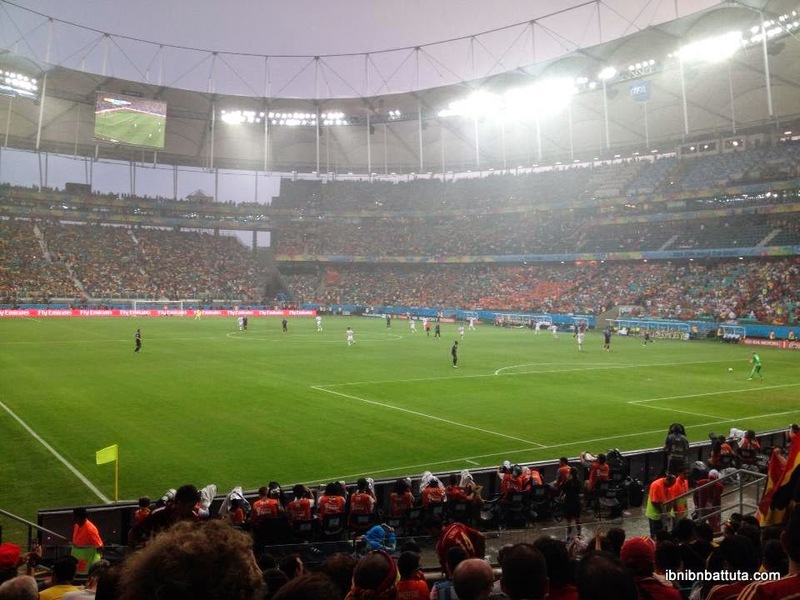 The Dutch—and their Brazilian supporters—were all going berserk. The defending World Cup champions were losing 5-1! Even the most optimistic Dutch fan would never have predicted this outcome. As I left the stadium (to rendez-vous with some new Aussi friends and cheer them on in their match against Chile), a few Brazilians sitting nearby told me, "Good luck to the USA, we will be cheering for you!" I thanked them and smiled, excited to soon head to Natal to cheer on the USA. As much as I enjoyed Spain v. Holland, I had no real ties to either country. I wanted to be among Uncle Sam's Army screaming for OUR team, singing OUR songs, and wildly celebrating OUR goals. Fortunately, I will link up with Uncle Sam's Army on Monday, and be in the stadium when we finally open our World Cup against Ghana. I BELIEVE THAT WE WILL WIN! Despite forgetting his funny Dutch triangle hat at home, Gavin still managed to make some new friends.